This illustration shows the migration enhance encapsulated growth (MEEG) process for producing 2D gallium nitride, which is facilitated by defects in the graphene lattice that act as pathways for intercalation. When the gallium and nitrogen atoms meet at the graphene/silicon carbide interface, they chemically react to form 2D gallium nitride. Image: Z. Al Balushi and Stephen Weitzner, Penn State MatSE. A newly-discovered method for making two-dimensional (2D) materials could provide them with new and extraordinary properties, particularly for a class of materials called nitrides, say the Penn State materials scientists who discovered the process. As an initial demonstration of their novel graphene-encapsulation method, the scientists have used it to conduct the first-ever growth of 2D gallium nitride, which could find applications in deep ultraviolet lasers, next-generation electronics and sensors. "These experimental results open up new avenues of research in 2D materials," says Joshua Robinson, associate professor of materials science and engineering at Penn State. "This work focuses on making 2D gallium nitride, which has never been done before." Gallium nitride in its three-dimensional form is known to be a wide-bandgap semiconductor, which is important for high frequency, high power applications. When grown in its 2D form, however, gallium nitride transforms from a wide-bandgap material to an ultrawide-bandgap material, effectively tripling the energy spectrum it can operate in to include the whole ultraviolet, visible and infrared spectrum. This work will have a particular impact on electro-optic devices that manipulate and transmit light. "This is a new way of thinking about synthesizing 2D materials," said Zak Al Balushi, a PhD candidate co-advised by Robinson and Joan Redwing, professor of materials science and engineering and electrical engineering at Penn State. Al Balushi is lead author on a paper on this work that appears in Nature Materials. "We have this palette of naturally-occurring 2D materials," he continued. "But to expand beyond this, we have to synthesize materials that do not exist in nature. Typically, new material systems are highly unstable. But our growth method, called migration enhanced encapsulated growth (MEEG), uses a layer of graphene to assist the growth and stabilize a robust structure of 2D gallium nitride." The graphene is grown on a substrate of silicon carbide, which is a technologically-important substrate used widely in industry for LEDs, radar and telecommunications. When heated, the silicon on the surface decomposes to leave a carbon-rich coating that can reconstruct into graphene. The advantage of producing graphene in this way is that the interface where the two materials meet is perfectly smooth. Robinson believes that in the case of 2D gallium nitride, the addition of a layer of graphene makes all the difference. Graphene, a one-atom-thick layer of carbon atoms, is known for its remarkable electronic properties and strength. 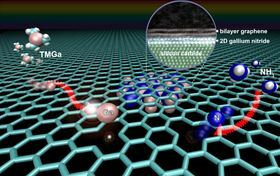 When gallium atoms are added to the graphene/silicon carbide interface, however, they migrate through the graphene and form the middle layer of a sandwich, with graphene floating on top. When nitrogen atoms are added, a chemical reaction takes place that turns the gallium and nitrogen into gallium nitride.